As a country of sharp contrasts where fire and ice coexist, dark winters are offset by eternal sunshine, and luminescent light shows- Iceland is one of the most fascinating countries on the planet. With a burgeoning and vibrant cultural scene beset against an otherworldly landscape Iceland offers a unique adventure and experience that’s only 5 hours away from the Northeast. 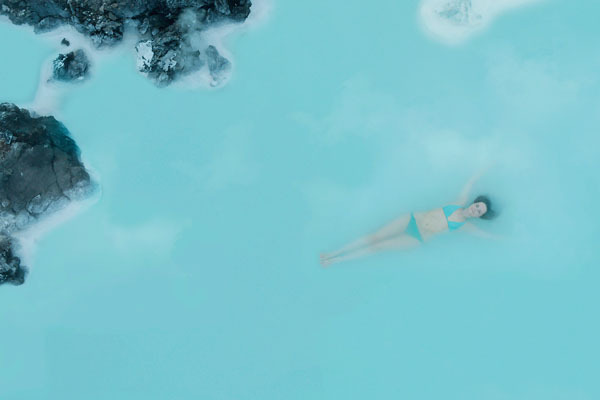 As the Empire State is to New York, the Blue Lagoon has become Iceland’s must visit attraction. Surrounded by a panoramic view of lava fields, the man-made lagoon’s water is fed from the Svartsengi geothermal plant. While the water is actually milky white, the blue comes from the silica and the way it reflects sunlight. During warmer days, algae starts to grow, providing the wa-ter with a hint of green. While an otherworldly view sufficient in attracting millions of visitors from across the world, the Blue Lagoon has a bonus factor. Water from the lagoon has long been known to have the ability to cure skin diseases and to condition and exfoliate the skin. After taking a dip in the warm waters, guests can check out the spa amenities. If it has been a lifelong dream of yours to try out a silica mud mask, the silica bar is the place for you. Leave the mask on for at least five minutes, and you’re guaranteed to leave the spa with skin as soft as a baby. Carved into the lava rock, guests can let off some steam in the sauna rooms while reflect-ing on the one of a kind landscape around the lagoon. The man-made waterfall can soothe sore shoulders and stiff muscles but guests are warned of the waiting times on busier days. But if you’re looking for a softer touch, guests can try out the in-water massage where you will be floating on the relaxing warm water while enjoying a rejuvenat-ing massage. If you’re simply taking a break from the water, the spa has a relaxation area where guests can enjoy calming music while admiring the view of the lagoon. Calling in a day, guests can shower at the lagoon’s private shower cubicles. Complimentary Blue Lagoon shower gel and hair conditioner are offered in the shower area. It is advisable to use hair conditioner beca use the geothermal water can make the hair dry. For guests of the exclusive lounge, the shower and changing rooms can accommodate up to two people. The lounge has to be booked prior to your stay at Blue Lagoon as it can only accommodate up to 12 guests. Prices range from €195 to €395 depending on the number of your party. A general admission includes a three hour stay and a complimentary skin care package. Guests are encouraged to step out to the deck for another take on the beautiful landscape. For geology geeks, the Blue Lagoon is your ideal destination as it provides 40-minute-long tours of the lagoon with tie bits and fun facts about the volcanic eruption and the formation of the la-goon. Priced at €15 per person, the tour includes a snack from the Lava Restaurant, a cocktail from the bar and a science lesson in the lagoon’s very own lab. Led by head chef Ingi Þórarinn Friðriksson, the Lava Restaurant is built into a stunning lava cliff that overlooks the lagoon. Prices start at ISK 6200 for its two course dinners and go up to ISK 9900 if patrons are hoping to feast their palette on dishes from the four course tasting menu. 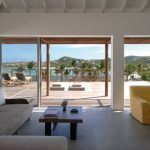 If you can’t get enough of the lagoon, Silica Hotel is minutes away from the Blue Lagoon. The hotel offers it own private bathing lagoon in the heart of the stunning lava landscape. But Blue Lagoon is in the midst of building their own luxury hotel which is set to complete in 2017. The spa area will connect the lagoon to the hotel. Cooperating with Blue Lagoon for almost two decades, the 60-room accommodation is designed by Sigridur Sigthorsdottir of Basalt Architects. 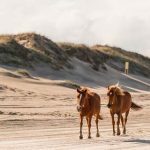 The lagoon offers hourly bus transfers to and from Blue Lagoon, Reykjavík, and Keflavík Inter-national Airport and free parking for those who are driving so there’s no need to panic over transportation. The lagoon has the words relaxing, calming, unique written all over it. So if you’re looking for an adventure without the hiking boots and perspirations, Blue Lagoon is calling your name. The appeal of Iceland is undeniable. From its unique rugged terrain, majestic glaciers and beautiful volcanoes to the legendary Blue Lagoon, it’s no wonder this destination has become one of the most popular “bucket list” spots for many Americans. 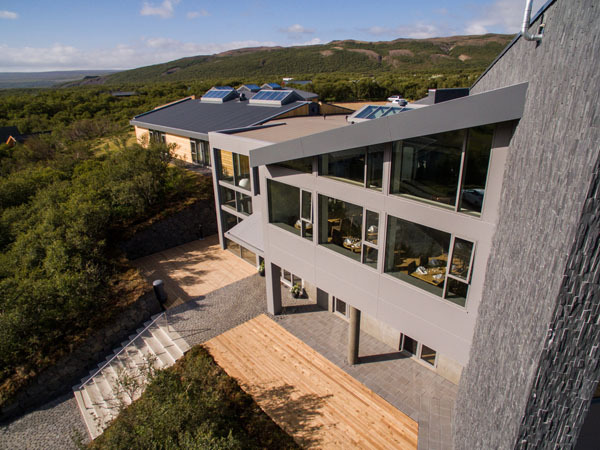 The Hotel Husafell, an eco-luxury hotel opened in July of 2015 located in west Iceland just 90 minutes from the capital city of Reykjavik, sits adjacent to a glacier and serves as the perfect base camp for those looking to experience glaciers, lava caves, hiking trails, horse riding, and much more. Owned and operated by the same local family for seven generations that also runs many other attractions in the area such as the thermal pools and campgrounds, this hotel is modern, sustainable, and family friendly. The area of Husafell itself has attracted Icelandic families for years, many keeping summer homes in this region. It’s also a popular stopover for travelers heading between north and south Iceland, and has been so for many centuries. The four-star Hotel Husafell defines sustainable design, contemporary style, and local artistry at its finest and the hotels is not only built in harmony with nature but is totally self-sustainable using 100% renewable energy produced from a small hydro-power plant and geothermal heated water from the nearby mountains. Only environmentally friendly materials are used including larch wood and gray slate along the building’s façade. The interior design embraces rich textures and neutral tones and incorporates local culture with artistic elements throughout the property. 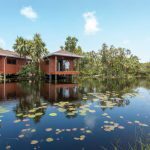 Accommodations are located directly on the edge of wilderness with trails just outside the hotel, allowing easy access for their guests. 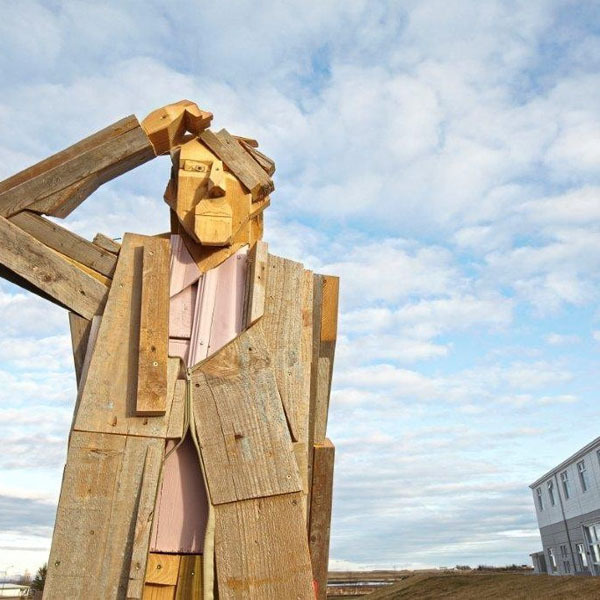 The hotel’s 36 guestrooms have floor to ceiling windows and heated floors along with paintings by local artist, Pall Gudmundsson. Guests can also enjoy outdoor thermal pools and hot tubs. If you’re a golfer, you’re in luck as the hotel has a nine-hole course with special hours allowing guests to play under the magnificent midnight sun. A typical day during your stay at the hotel will begin with a complimentary Icelandic breakfast followed by a hike through the many miles of trails that will take you through dense woods, lava formations, and glaciers. The hotel also offers a variety of day tours such as riding a super jeep through the rough Iceland terrain and up to the top of Iceland’s second largest glacier. Guests can also hike to the Hraunfossar waterfalls, cascading from under the lava fields into a river below. There are also numerous lava fields around the hotel that are close to lava caves including the caves of Surtshellir and Víðgelmir, some of the largest lava caves in the world. Guests can also take a tour to the ice cave of Langjokull, Europe’s second largest glacier sitting at about 1200 meters above sea level. If hiking does not catch your interest then take to the sky. You can book an airplane tour through the hotel on a “flightseeing” expedition for a bird’s eye view of the beautiful Hasafell landscape. The hotel’s gourmet restaurant features floor-to-ceiling windows where diners gaze upon Eiriksjokull Glacier glistening under the midnight sun of summer, or the magical Northern Lights of winter (Husafell is one of the best places in the world to see them). The Nordic inspired menu owes its flavor and richness to the mouth-wateringly fresh ingredients of locally caught seafood, game and high quality produce grown in nearby geothermal greenhouses. 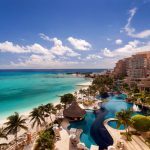 For dinner, the menu is extensive with starters offering fresh ceviche, fish soup, and smoked goose breast among others. For main dishes there are a variety of options from which to choose including lamb, salmon and beef tenderloin. There is a children’s menu available as well. And for dessert, be sure to try the cheese platter with fresh Icelandic cheese served with biscuits and caramelized onion. The Hotel Husafell allows guests to experience all the beauty of Iceland while also offering a taste of the local culture, tradition and hospitality. 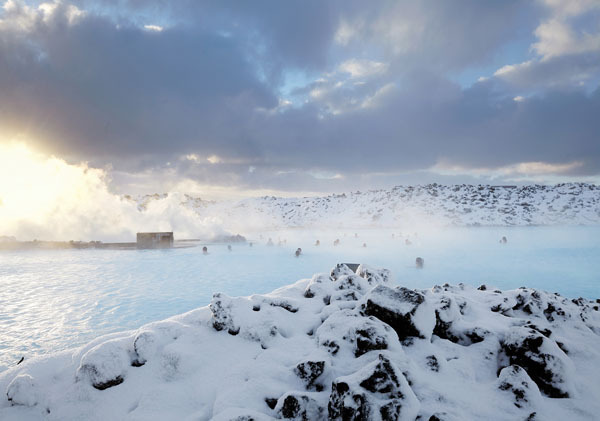 Dramatic landscapes dotted with volcanoes, geysers, hot springs and lava fields, the Nordic island of Iceland exemplifies the power of nature with its extraordinary vastness, its healing geothermal lagoons, and its supercharged splendour. From the spectacular aurora borealis’ or the soft pinkish hue of the midnight sun, to its cultural life, which celebrates a literary legacy and remarkable art and music, Iceland is truly a magical land. The glittering glaciers in winter and lush verdant hills and long fun-filled days in the summer make it a perfect destination to visit year round which is not only filled with possibilities for adventure and spectacular vistas but can also have a transformative effect when you become one with all the local natural wonders. With so much to discover and experience, exploring the vast country can be a challenge. Icelandair Hotels Group provides a wide range of hotels at key locations on the ring road around Iceland, making your selections for hotels a logical and convenient one. A chain of eight Icelandair Hotels cater to a range of different budgets, from Hotel Edda, a chain of conveniently located economical summer hotels throughout the countryside, to the Hilton Nordica and the newly opened Canopy Reykjavík City Centre in Reykjavik which cater to premium travellers. 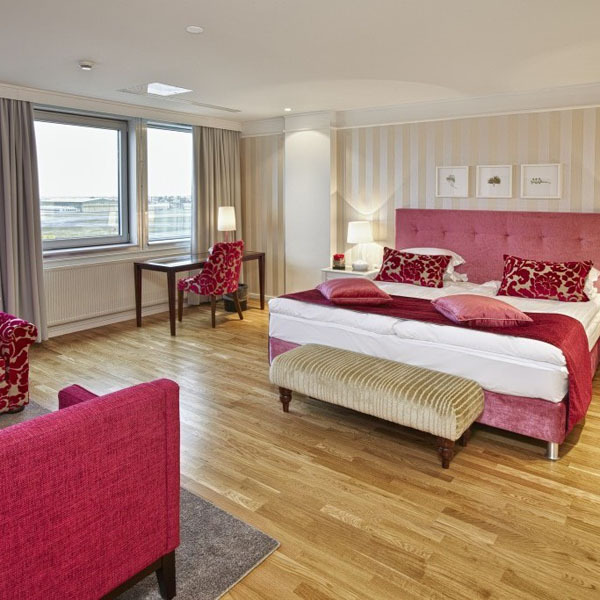 Spacious and a classic, this hotel is situated in the financial district and a short five minute walk from the outdoor park Laugardalur which is home to the Reykjavik Botanical Gardens, Zoo, the biggest geothermal swimming pool in Iceland, and many other attractions. The Nordica is elegantly designed in sleek Scandinavian style and features a cozy fireplace and cocktail lounge in its modern lobby. Easy-going and timeless, the Nordica is a safe bet that accommodates all travelers looking for an enjoyable and comfortable stay. 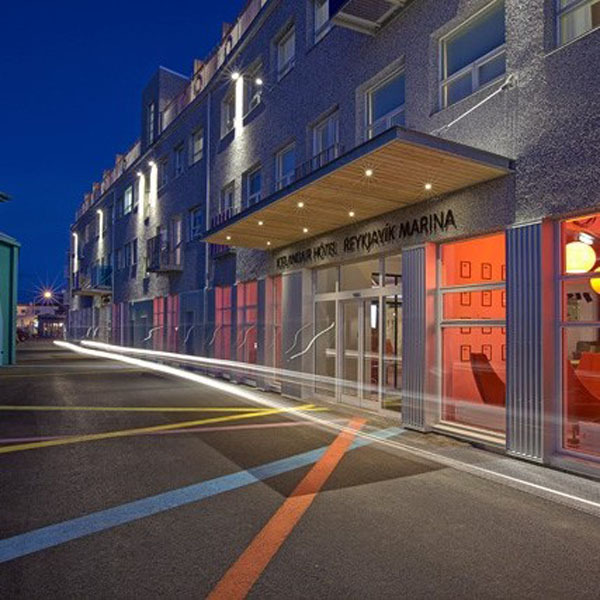 Reykjavik Marina Residence, opened in December 2015, feature stunning luxury suites located in a beautifully restored historical building. Cozy yet luxurious, these suites decorated in an Icelandic traditional style with modern amenities, feel like an upscale home away from home. 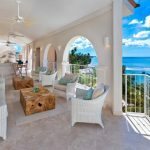 With panoramic ocean views and popular bars and restaurants nearby, you have the best of both worlds – tranquility and entertainment. 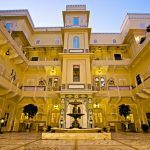 And if you need assistance making any reservations or plans, your personal concierge can cater to your every desire. The first Canopy hotel in the world, Canopy Reykjavik City Center is a new brand by Hilton, ideally located in the heart of downtown Reykjavik. Their “Just-Right Room” concept boasts accommodations that are thoughtfully designed in Icelandic themes of ocean, ice and volcanic rock, and include everything you would want for a perfect stay. That also includes high-tech amenities and even a Break Fast Bag delivered each morning to prepare you for all the adventure awaiting right outside your doorstep. 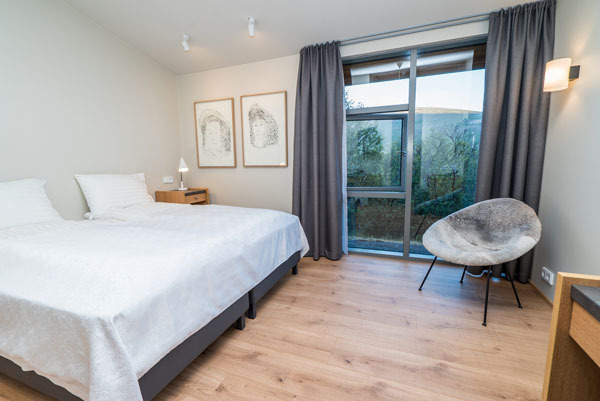 Located in the beautiful surroundings of Öskjuhlíð hill and Nauthólsvík beach, The Natura is a perfect option for those seeking serenity while also being able to enjoy the excitement of Reykjavik’s historical city center which is within walking distance. After a refreshing morning walk or a full day on the town, be sure to stop by for a day of pampering in the hotel spa, The Soley Natura Spa, or dine at Satt, the in-house restaurant serving up authentic dishes utilizing fresh and locally sourced ingredients. The 220 rooms, many which are themed, allow you to experience one of the many natural elements of Iceland, from moss, glacier, northern lights, volcano, geothermal or natural water rooms. Immerse yourself in nature while you sleep as well as while exploring the great outdoors. 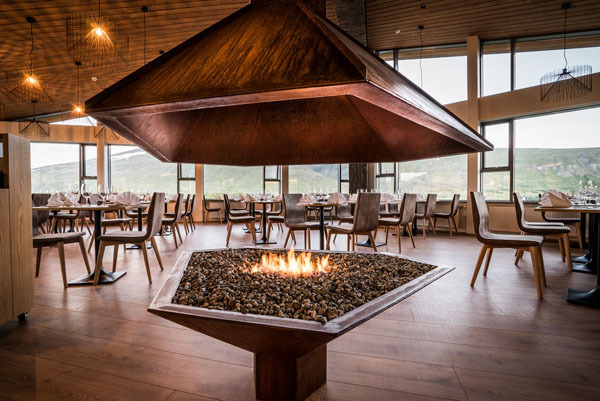 Other excellent properties are scattered around Iceland including Icelandair Hotel Fludir, located in the south of Iceland in the charming village of Fludir, as well as the Hotel Vik, even further south in the scenic Myrdalur Valley. 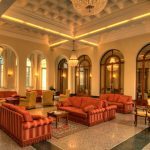 Regardless of your hotel choice, Icelandair Hotels ensures that all its properties are pristinely kept and offer all the amenities and service you would expect at top-notch hotels. They strive to embody the spirit of Iceland through their simple yet elegant design aesthetic while also honoring the natural beauty and unspoiled nature around it. Icelandair Hotels also recognize their environmental responsibility and remain dedicated to improve their environmental performance by maintaining Green Hotels countrywide.